We want your photo! 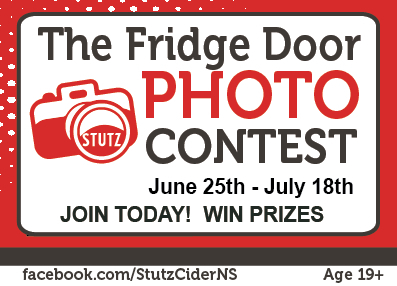 Join the Stutz Cider’s The Fridge Door Photo Contest! We are on the lookout for the best photos of your fridge door - with the new Stutz Premium Craft Cider 750ml bottle! The inside of your fridge door is the ideal place for Stutz Cider in your home. The 750mL bottle has a screw cap top to aid in resealing the product for your convenient use over several days. So pour a little or pour a lot, enjoy it with Monday’s dinner or relax with it on a sunny Friday afternoon, all from the same bottle. Now you can enjoy the same bottle of Stutz Premium Craft Cider throughout the week! JOIN TODAY! See below and learn how easy it is to join the contest! Step 2 - Log in to Facebook and go to our Facebook Page facebook.com/stutzciderns. Step 3 - Click The Fridge Door Photo Contest – or click here http://woobox.com/mzycgm- and follow the instructions on the page. Step 4 - Like Stutz Cider's Facebook page, if you already haven’t. Step 5 - Upload the photo featuring your fridge door with bottle of Stutz Cider along with a short caption story. You’ll also need to fill in the required info such as name, email, age, and phone number. Step 6 - The public votes on which photo they like the most. So be sure to share your photo with family and friends. Step 7 - WIN! There will be a weekly prize draw based on originality and creativity and it will announced on our Facebook Page. Also, the most popular photo (most votes) win! Share the contest. Tell your family and friends to vote for your photo! Good luck to all!! No purchase necessary. See full Contest Rules here. By submitting a photo, you’ll be signing up to officially enter your photo. Winners will be contacted by the Stutz Cider Team. Once you’re a confirmed winner we will mail or courier to you your prize! The contest is available to people on Facebook. A Facebook account is free and you can enter the contest any time up until July 18th, 2013. You may also choose to enter by submitting an 800 word photo essay as another form of contest entry. The entry must be a photo and an essay that answers “Why this summer will be a great one with Stutz Cider” and must include your name, address, email, contact number and birth date. This can be mailed to SBC – The Fridge Door Photo Contest at 1559 Brunswick Street, 4th Floor, Halifax, NS B3J G1. Do I have to like the page? Yes, liking the Stutz Cider Facebook Page is required to enter The Fridge Door Photo Contest. How many photos can I enter in this contest? You are allowed to enter a maximum of two (2) photos. Voting is allowed once per day. There will be three weekly winners to be selected based on their entry’s originality and creativity. Also, the photo with the most votes at the end of the contest will be named a winner. You are only allowed to win once in all the weekly prize draws. The photo with the most votes may be a repeat winner. The contest is only open to residents of Nova Scotia aged 19 or older except employees, representatives and agents of the contest sponsor, their affiliates and their respective advertising and marketing agencies, contest administrators, judges and persons domiciled with any of the above. Anyone can vote starting June 21st; one vote per Facebook account per day. Please be advised that using “like exchange boards”, providing payment for votes or use of multiple or fake Facebook accounts are against contest rules. See Contest Rules here.